Provide an elegant and sturdy foundation for your menu cards, specials, table numbers, and more with this Choice 1 1/2" tall stainless steel clamp-style menu / card holder. Resembling the shape of a goal post, this holder firmly grasps your signage. Featuring a beveled design, this stylish holder only touches your menu in two locations. This minimized contact provides a steady hold on papers and posters without indenting, bending, or otherwise defacing your signage. Furthermore, this stand's sparkling silver-colored exterior catches patron's attention, while the two vertical arms draw your guests' eyes upward towards your important message. I was very surprised w it th the weight of these. They are heavy enough to hold place cards much larger then their size and hold up against wind very well. I purchase 7 and I'm looking to get more! These are perfect for displaying our flavors every day! They look great on the stand in front of our cupcakes and they are the perfect size - not too big so they don't block our display! They also stand up straight really well and never tip over. We would recommend these to anyone looking for a menu holder. These card holders are pretty tiny and a little cheap looking, but if you have a lot of small cards to display deli or baked items, they would be fine. Love the idea of leaving special messages for my kids on the table. This little card holder makes it super easy and fun. They even leave messages for me. The clip holds nice and tightly and the holder seems quite well-designed as it does not tip over to easily! We purchased these for display cards in our pastry case. We love that they are stainless steel because they are easy to clean. The clamp works great and holds our cards perfectly upright. You can't beat the price either! Gorgeous, I love these, they are shinning and offer a beautiful presentation to your menu cares. I orders 12 and I will be ordering 12 more. I use these to hold my card numbers I give my customers and it works perfectly. I like it better then just standing up your numbers with a table tent. Easy to use, stable and sturdy little clip stand perfect for menu descriptions. We use it for our farmers market booth and all catering events. These are very light weight, so do not hold in the wind. I would not purchase these again, unless I used them for indoor events only. These card holders do great at displaying bakery tags for our store. We like to make sure that we have plenty on hand at all times. I purchased a dozen of these card holders to use to display the names of menu items for buffet setups and they do their job extremely well. I use them to hold 4"x2" chalk boards and I have never had an issue with them tipping over once. They are simple, cost effective and will be buying more of the same whenever I need more. These card holders are great to use in the baked goods case to hold cards labeling which each item is. They look great and are very sturdy! This is great! Can’t do anything without it. It works for recipe cards, seating arrangements, ticket holders, and much more! This 1 1/2” stainless steel clamp-style menu/Card holder was the thing I needed in my life! great retro style place card holders. We often use for fancy food tags. They have a classic design that does not take away from your paper design. This is stainless steel clamp-style menu card holder works very effectively and is a nice product because of its low-profile and compact size. The three tiered base may help it be more sturdy but we would prefer if it didn't have as much detail in preference of a sleeker design. Overall it is a functional product at a good price. This menu/card holder gets the job done but I’d prefer if the clamp wasn’t so tight. It makes putting thinner cardstock in without ruining the paper. The perfect piece for a business card holder. It is small and fits nicely on my already overcrowded desk. Its also made of stainless steel meaning it will hold up well to heavy use and drops. We use these card holders to identify items in chafing dishes and different salads so guest can easily read what they are choosing. We use card stock paper to print on and keep them in a file so they are easy and quick to use- guests appreciate the labeling. Clamp is a bit on the weak side, but good deal for the price. I use this to display photos, etc on my desk. Good looking stand. The one and a half inch stainless steel clamp-style menu and card holder is exactly what I had hoped. It is the perfect size and design to hold name cards, reserved signs as well as daily special lists. I appreciate the clamp option allows me to change card stock for different menus. The sleek look and stainless steel color offer a delicacy to any table, and it is tall enough to be seen from a distance. The mistake on ordering this product was on me-the specifications are very concise as to what you are ordering. I write this review to help others avoid this product if their needs are the same as mine: name card on a buffet line. It is clearly stated that the design, while unique, is still only 1 1/2" high & for the most part, light in weight. The base is so small that there is no practical hope of stability while in use. Service staff was forever standing the little card holder's back up until finally we gave in & took them down. Great little design but certainly not a card holder for a busy catering service. Great card holders. We use these for reserved signs on our tables for dinner service; they are heavy enough to not fall over and can hold a 2"x 3" reserved sign. The 1 1/2" Stainless Steel Clamp-Style Menu / Card Holder met my expectations. The price is very reasonable and the quality is very good. I would definitely recommend! Great way to hold up a menu card or business cards. It's not ideal for large items, but it does a great job at display short items. Really good for the price. This works really well for me because I use it to hold up recipes in my kitchen. I think it would be a bit more difficult to use for thick menus. We use these to hold cards that contain specials of the day or week. Easily ckamos in and hold the card, and is made of durable stainless steel. These stainless steel clamps are pretty nice. The price is as good as you'll find. But, after time they tend to not clamp down tightly. It is a super acute sign holder. I used them at my wedding to number my tables. The guest had no problem finding their seats. Great Weight. I have had some of these that had no weight to them, but these are very sturdy. Could hold a strong weight paper and not tip. Simple and easy to use, these holders are very handy to have around. I use them for labeling/ pricing items at farmer's markets. They are simple and elegant. These are awesome! There good quality and they are perfect for a salad showcase in a deli/ café/ bakery/ etc. I would definitely recommend these! I also purchased the mini chalk boards and they look very nice and professional ! Very nice looking card holder. This is the style we decided that we would go with after trying out several different ones. It is has a nice low profile, so that you can use smaller cards, and see low profile desserts behind it. I am the restaurant owner and i am using this item from last couple of months everyday for my buffet item its really good & hold any kind of card & menu . well-made, very elegant. I fell in love with it. the bottom of it is lined with black velvety cloth so that it won't be slipped. This menu/card holder is good. And it doesn't cover up the price or item description. I like it. I will buy again for my cards. These are fine for what they are. I had to work a bit to get them to clamp tightly enough to hold my cards, but hey, they're cheap! Note: these are small and really work best with smaller cards. Check out larger ones if you want anything that'll stand out more. These were just what I was looking for to display name tags for the ever changing flavors in my bakery case. They have a sturdy base that stands up well on my slanted bakery trays. I easily slid in a simple piece of folded paper to the holder. I think these add a clean and classy little touch to my case. These card holder make identifying appetizers even easier. They aren't to tall where they block out the actual item. They clean up well and they have some weight son they won't fall over easily. The 1 1/2" Stainless Steel Clamp-Style Menu / Card Holder works great to display the St Patrick's Day holiday for the little ones, "Happy St Patrick's Day." on my island. When they come up stairs and see the St Patrick's Day sign they know it is officially St Patrick's Day. You can use normal paper to make the sign. Excellent quality! We use these everyday in our business. They hold up to children dropping them and many people handling them. I highly recommend these! We liked these items simple, strong and very easy to display our baked goods, pastries, and steam table in store. The stainless steel worked great in heat or in cold display areas. This is a nice clamp-style menu/card holder. I use it for name cards. I think it looks very nice, and it looks more expensive than it really is. I use these along with the mini chalkboard cards to label and price my sweets for customers to view. Very professional looking and very sturdy. These Stainless Steel clamp style menu holders work perfectly for displaying the names of our products. I even lend them to weddings and events and they love them too! The absolutely perfect little thing for holding flavour labels for my cupcakes! Useful for weddings, events, etc. Also handy for holding recipe cards, and so reasonably priced. Expected these to be one piece, but the arms actually remove from the base, so it is a little more complex than just sticking the card in place. They do pinch the card tightly, however. These are lightweight, so if you need something for outdoors, consider something heavier. These worked fine for pricing at our indoor shows, however. Great for displaying description of menu, treats, items. Well made, sturdy, looks great on dessert tables , catering. Can also be used to hold photos. These cardholders are great! I use them to display my product signs at my baked goods stand at the farmers market. They are small but will hold a pretty big sign and are very classy looking. Also, they are a decent weight and not too light. These are great high quality menu card holders. I'll be using them for all of my events and they're small enough to fit on serving trays. The stands are a great buy. They are very sturdy and nice looking. They hold up light and heavy sign for us. Well balanced stands. We use these for our name tags for our cupcakes- they have lasted quite a while, although some are getting a bit loose so the mini black boards fall out- Perfect height! Overall, good buffet/menu cards! I used them for my daughter's birthday part as food label holders and worked. I had so many compliments. The good thing is they are re-useable and looks great. We use these to hold the name plates in our bakery case, they work well and hold up. Very cost effective and make the case look professional! Can not beat the value of these little guys. They are a nice crisp and clean way to hold little signs or notes so that customers will be sure to see. Ordered the menu holder to see the quality before I placed a mass oreder of them. To my surprise, it looked great. Will be ordering more. These are a great and affordable menu card holder. These paired with the 4x3 menu cards look much nicer on our tables than the plastic displayettes we used before. These are great for buffet lines. You can list any potential allergens that could be in the dish. Or you could just have the name of it listed. I use these to display whats in the chafing dishes. They are a nice size and can be used with a thicker card. Good value. 1 1/2" Menu / Card Holder is a great sturdy product and works great with the erasable chalk mini boards. Looks great and priced great. I've used these menu card holders to identify my items when on a buffet table. I print out descriptions on stock card and place them in the holders on the table. This way customers know exactly what is on display without having to ask. I use all the time as food labels on my table buffet.Very sturdy and will not wobbles as other card holder that I have. Proud to recommend. We use these stands for our catering events. They're a bit on the light side as far as weight, so we use a fairly light paper. However, at this price, even misplacing some at each event isn't that bad. These little card holders were perfect for our use on one of our custom built cupcake stands to hold description cards of the cupcakes! We used them in each section of each tier! They are classy and added a nice touch! Great little card holders. I used them at a Bake Sale to display what the baked goods are along with the price this way I didn't have to keep repeating myself & service was much quicker. They are big enough to hold a business card size without overpowering the baked goods. My only regret is I didn't buy enough of them, which I will do now. They are small but hold a lot of weight. They are great for card settings on tables for special events. I used them for menu cards on the tables for guest. The price is great also. 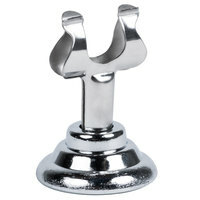 These little place holders are a wonderful way to inexpensively add a great attention to detail to your event. Every time I use them I get compliments! These little darling things are by far my favorite purchase from your company so far, actually, i am going to purchase more, they are so cute, and work great! These little guys are attractive for holding up table numbers/identification signs/etc. You may need two of them to hold up larger cards, especially if you're outdoors. These work great. Good price too.